Is it a phone? Is it a pad? We'd already got wind of a number of Asus tablets that are supposedly on the horizon and now more details on three of them have leaked online. Specifications for the FonePad HD 7, MeMo Pad HD 8 and MeMo Pad HD 10 popped up on Italian site Notebook Italia. 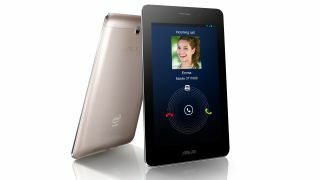 Considering we already have the Asus FonePad and the Asus MeMo Pad HD 7 - prepare to get confused. We'll start with the FonePad HD 7, a tablet that thinks it's a phone, allowing you to make calls and send texts as well as use data from your SIM-card. The 7-inch tablet is reportedly due to pack a 1280 x 800 resolution on a LED IPS display, 1.6GHz dual-core processor, 1GB of RAM, 5MP rear camera, 1.2MP front camera, Android 4.2 Jelly Bean, Bluetooth, Wi-Fi and 3G - so not a huge step up from its predecessor. There'll supposedly be a choice of 8GB and 32GB models, although we wouldn't be overly surprised if a 16GB version appeared at some point too. We're not done there however, as to go with the recently launched MeMo Pad HD 7 Asus may well be lining up two more tablets for the range: the HD 8 and HD 10. It appears that the MeMo Pad HD 8 and MeMo Pad HD 10 will share a variety of specs including a 1.6GHz quad-core processor, 1GB of RAM, 8GB of internal storage, 2MP rear camera, 1.2MP front camera, Wi-Fi and optional 3G connectivity. The difference between the two are the screen sizes, with one sporting an 8-inch display and the other a 10.1-inch one - we don't need to tell you which is which. A slightly disappointing detail is the fact that both screens have the same resolution as the FonePad HD 7 - at 1280 x 800 - which means the larger 10.1-inch tablet may suffer from some serious pixilation. There's no word on a release date or price for any of these tablets, but we'll be keeping our eyes peeled at IFA 2013 next month for anything new from the Taiwanese firm.